I think my little one is addicted to Nutella. Seriously, he would eat it every day if I allowed it. For the record, I don’t, it’s a treat. I can’t blame him actually. Who does not love this chocolatey-hazelnut spread inside a warm crepe? It’s totally my fault, I introduced him to this dessert spread years ago. He’s been a fan of it (and crepes) ever since. Most of you know this already, but Nutella is a brand of sweetened hazelnut cocoa spread manufactured by the Italian company Ferrero. This sweet treat was first introduced in 1965. The creation of Nutella can actually be traced back further, to the mid 1940s, when there was very little chocolate available due to rationing in WW II. A bakery owner named Pietro Ferrero from the Piedmont, Italy region began using hazelnuts (which were common to the area) to help extend the limited chocolate supply. Ferrero called this product, typically sold in blocks, “Pasta Gianduja“. In 1951, Ferrero began to offer a creamy version he called “Supercrema“. It was not until 1963 that Ferrero’s son Michele Ferrero rebranded his father’s Supercrema and began marketing it throughout Europe. With only slight changes made to the original formula, Ferrero renamed his father’s invention “Nutella”. The very first jar of Nutella left the factory on April 20, 1964. Nutella became an instant success and remains so today. Now there are tons of Nutella-like products out there, some more healthful than the original. 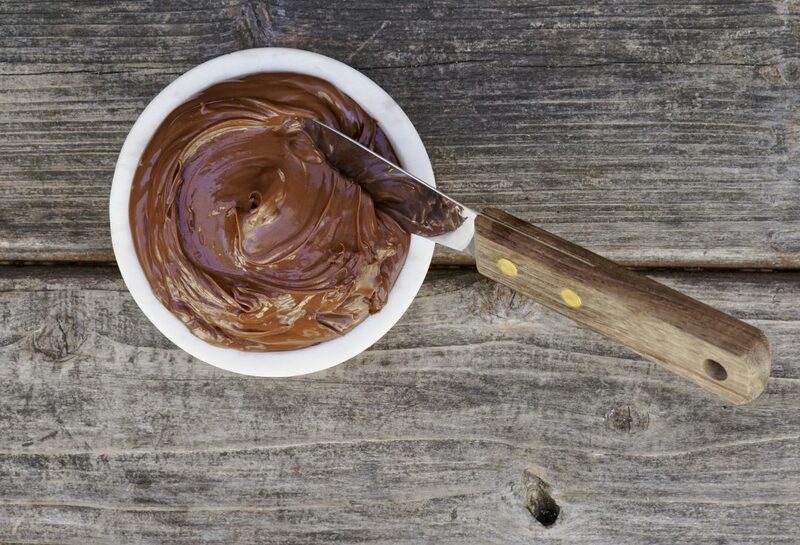 Although I’ve yet to try it, you can make your own homemade Nutella-like spread at home. If you’re interested, David Leibovitz makes a great one. if you’re looking for a vegan chocolate-hazelnut spread option, try this. 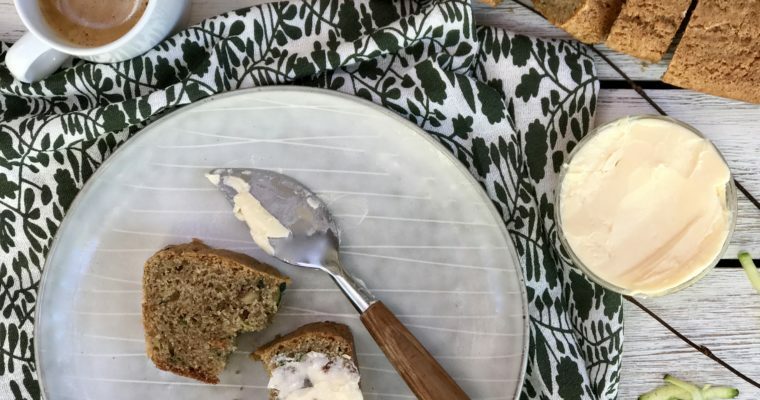 No matter what brand or version you use (store-bought or homemade), this chocolate spread is tasty and fun to use fun baking. There are many recipes out there using Nutella; I’m sure folks have tried just about everything. But this is a recipe I put together for my little Nutella lover on a cold winter day when he was home sick from school. Let’s just say, it made him feel happy. I don’t bake a lot of breads. 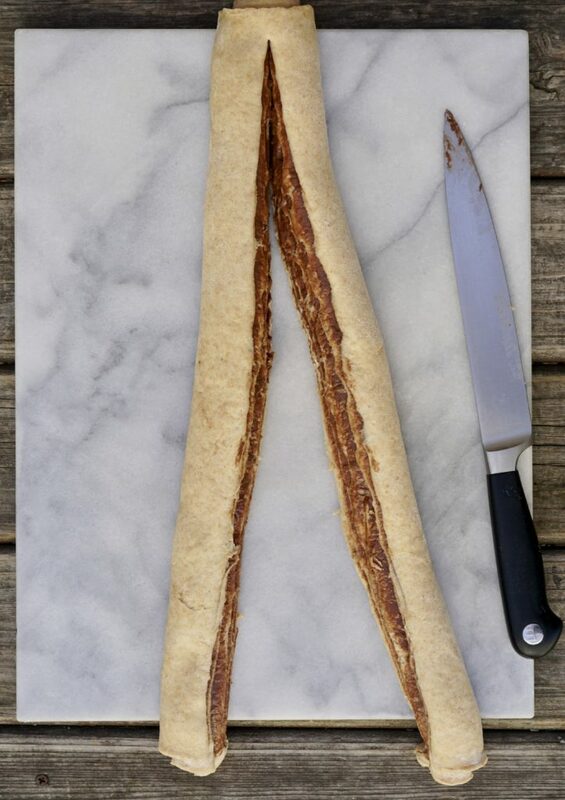 Breads take time, patience and great skill. But this is a an easy bread, using a dry yeast and not too much rise time. I used a mixture of whole wheat and regular flour to make the texture slightly more interesting, at least to me. 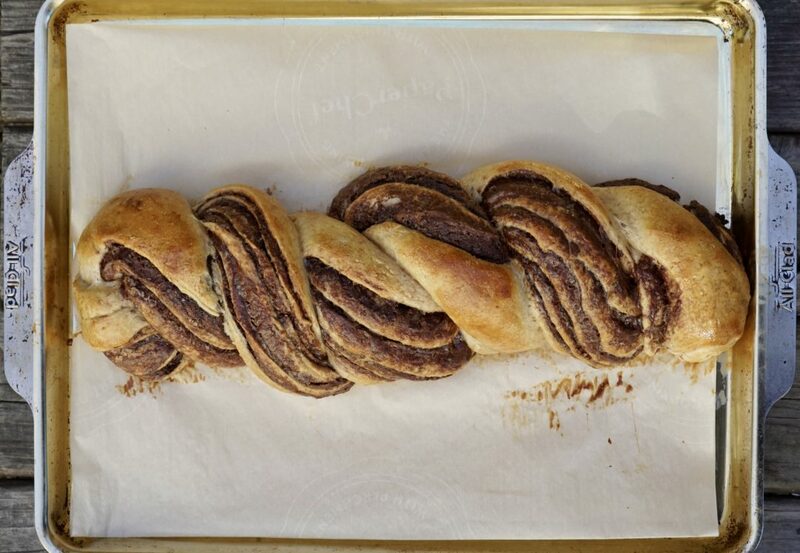 To make this sweet Nutella bread, you just need to follow a few simple steps to get the appearance you want. 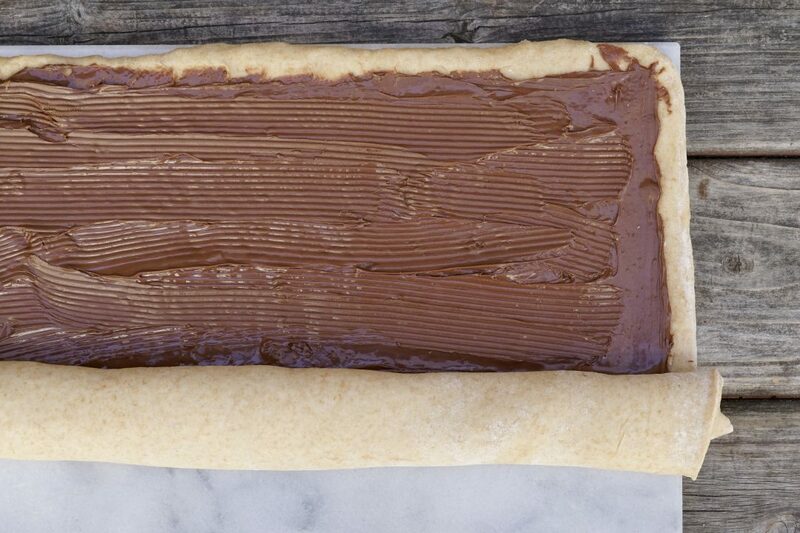 Once you roll the dough into a rectangle, you want to evenly spread the Nutella on the dough. 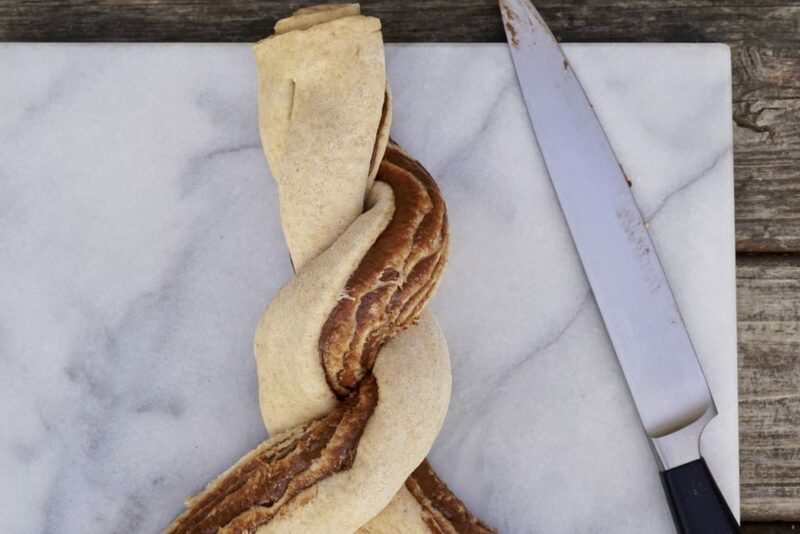 Cutting the dough almost entirely lengthwise will help you get that beautiful breaded appearance, similar to challah bread. Braiding the two pieces of dough and try to make sure that the chocolate is visible on the outside for all to see. Once the dough is braided, allow it to rest and rise slightly before baking it off. In just 20 minutes, your beautiful Nutella bread is done. 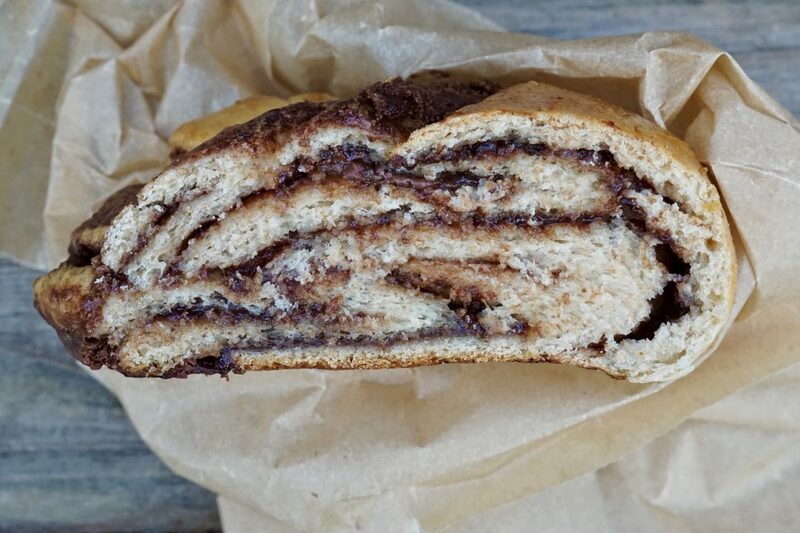 With its layers of chocolate weaved in, it resembles another favorite of my family: the time-intensive chocolate babka or even more decadent chocolate babka with mixed nuts. 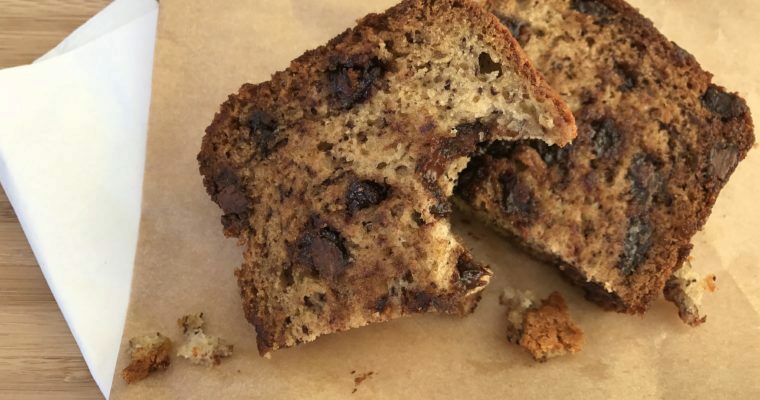 But this bread is not nearly as sweet as babka. Of course, if you have a real sweet tooth and want more of a dessert, you can increase the sugar. For me (and my family) we prefer a slightly less-sweet treat. Step 1 In a large mixing bowl add both flours and the salt. Mix well and set aside. Step 2 In a small mixing bowl add the yeast, sugar and warm milk. Whisk to blend. Add the melted butter and 1 lightly beaten egg. Mix well to incorporate. Step 3 Pour the yeast-milk mixture into the flour and using your hands, gently knead until well blended and the dough begins to pull away from the mixing bowl. Shape the dough into a large ball. Spray the mixing bowl with cooking spray and place the dough inside. Coat the dough lightly with cooking spray. Cover the bowl with plastic wrap, place in a warm place and allow the dough to rise for about 1 hour. Step 4 Line a baking sheet with parchment paper and set aside. Step 5 Once the dough has roughly doubled in size, gently deflate it by pushing it down gently with your hand. Remove the dough from the bowl and place on a lightly floured work surface. Using a rolling-pin, roll the dough out into a large 14×12-inch rectangle. Step 6 Using an offset spatula or knife evenly spread the Nutella out on the dough leaving about 1/4-inch border, as shown in the photo above. Step 7 Using your hands, gently roll the dough away from you, forming a long even log shape. Step 8 Turn the log lengthwise. Starting about 1/2-inch from the top, insert a slicing knife and cut the dough in half lengthwise. 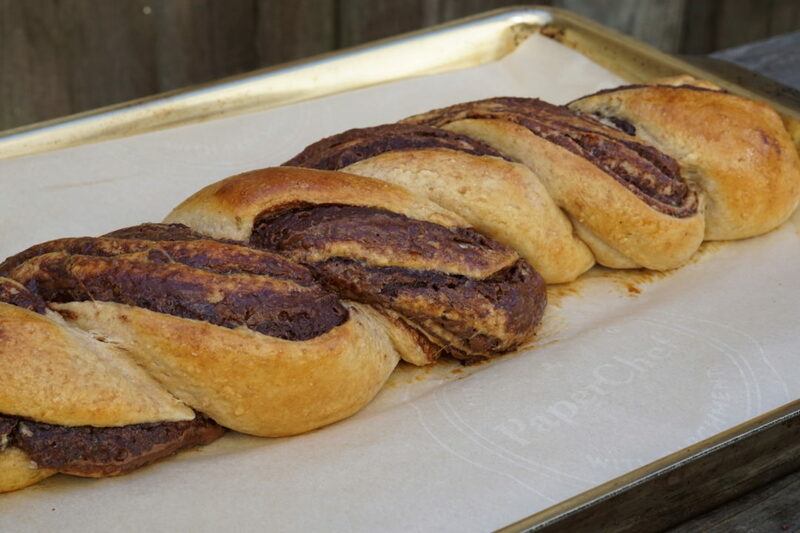 Braid the two pieces of dough, doing your best to keep the exposed chocolate layers on the outside of the braid. 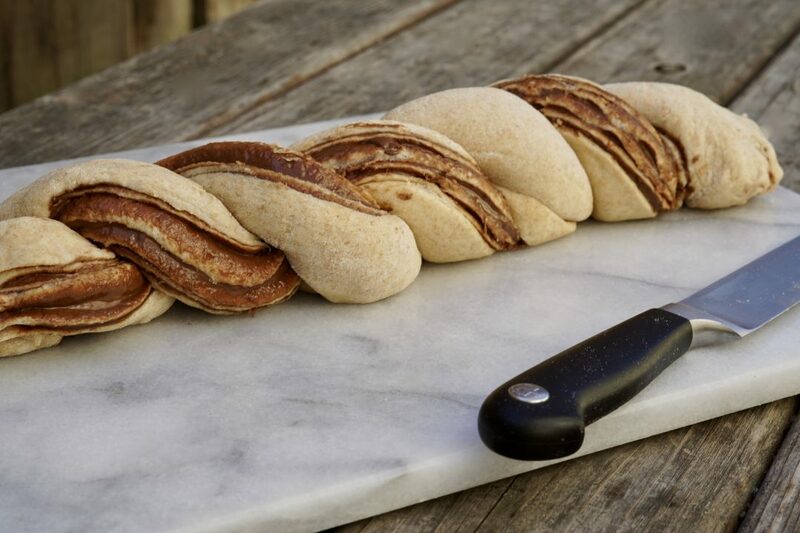 Pinch the two ends together and gently tuck underneath the loaf. Place the breaded dough on a the prepared baking sheet. Cover with a kitchen towel and allow to rise for 20 minutes. Step 9 Preheat the oven to 350 degrees F.
Step 10 Lightly brush the braided bread all over with the egg wash. Place in the oven and bake for 20 minutes until golden and firm to the tough. Step 11 Allow to cool slightly before slicing. You are very welcome Sophie. 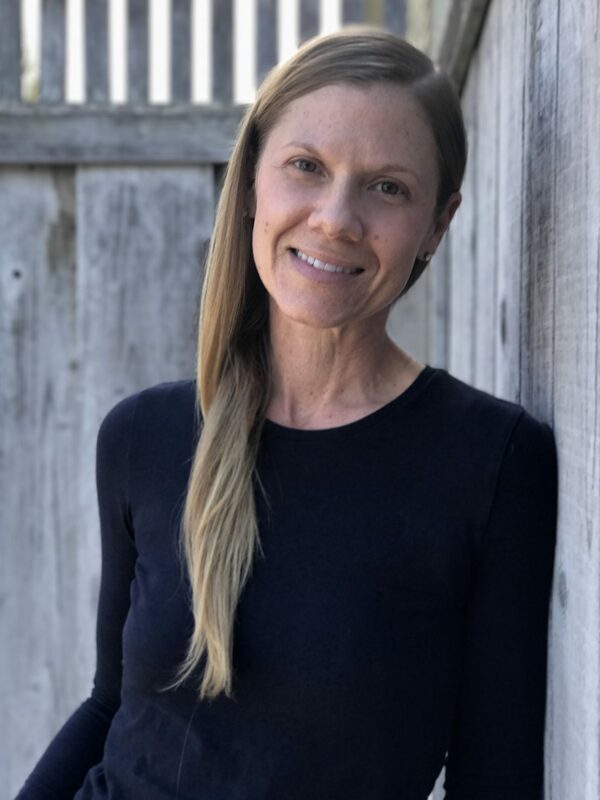 Thanks so much for reading and for taking the time to write a comment, so lovely of you.